It had been 5 years since we conducted a Best-ter-est of Omaha reader poll. Looking at the old results, it's easy to see why it was time to do another one. Though we'll never have the voter turnout that some other polls may have, I'm okay with that. Quality is what matters. I view this as a curated list. 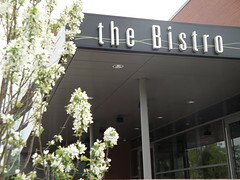 Curated by the die hard food fans that encourage restaurateurs to bring new ideas into Omaha. Curated by the people that aren't satisfied with good enough â€• the passionate that will seek out the best, travel into the unknown, and support our favorites through fervent word of mouth praise. Thank you for being part of our curation team and being part of our effort to praise the Best-ter-est of Omaha. The United States is often called the melting pot of the world. Many cultures living together under one roof so to speak. Yet outside of places like Berkeley CA, the diversity in most cities is segregated into little cloisters. Out of these enclaves come neighborhoods that get labels like Chinatown, Little Italy and Spanish Harlem. And of course in each of those, you'll often find the best of that region's cuisine. 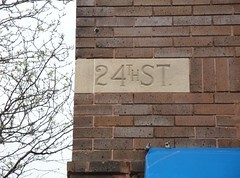 In Omaha, 24th street not only connects South Omaha to North Omaha, but it also connects many cuisines to one another. You can take a culinary tour around the world by starting at one and working your way towards the other. And that's what we did. 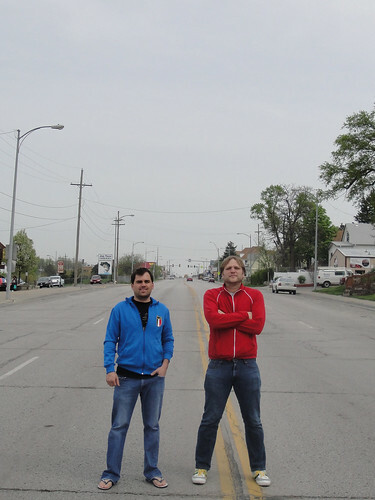 With the company of Paul Kulik (Executive Chef; The Boiler Room) and Nick Strawhecker (Executive Chef; Dante Pizzeria Napoletana), we started just South of the South Omaha Main Street Historic District and ate our way up past the Near North side. We sampled Mexican, Thai, Ethiopian, Barbecue and Soul Food with some good old Midwestern fried carp and beef jerky thrown in for good measure - all in about 4 hours. 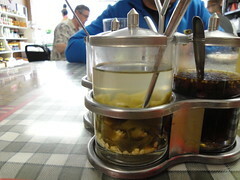 For some people, wandering into a random ethnic restaurant and ordering something unfamiliar is a bit terrifying. I'm here to tell you to just let go; don't be afraid. If need be, ask for help. As long as you avoid your allergens, nothing is likely to kill you. And if it tastes gross, so what. It's just food. Order something else. The point is you don't have to travel to eat exotic foods. My bet is that there's something on a menu in town that you've never had before. It could be something as simple as a Mexican mole to something as exotic as bird's nest soup. Just get out there and explore what your city has to offer. So let's take a look at some of the things we discovered during our trek. How would you like to start your morning off with one of these each morning? 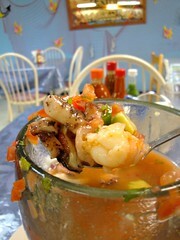 El 7 Mares is open at 10 am each morning and specializes in seafood from a distinctly Mexican perspective. We asked our waitriss what their specialty was and she pointed us to the La Campechana Pescado Cocteles. This massive goblet was filled with a a nice tomato broth similar to a gazpacho with piles of shrimp, calamari, octopus and oysters. This was much sweeter then cocktails any of us had tried in the past and was a great way to begin our day. Putting that memory behind us, we headed to our most anticipated destination of the day - Taqueria Tijuana. 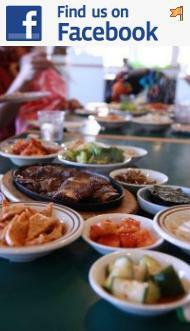 Many a debate is often had about where to find the best Mexican food in Omaha. 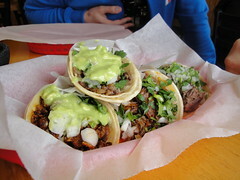 Many of our trusted friends have told us about the amazing tacos at Taqueria Tijuana, yet none of us had been yet. Cut to the chase: A-M-A-Z-I-N-G! There was some very colorful, passionate language used, but I'll paraphrase and just say "That's a damn good taco". I think the phrase "Best Taco in Omaha" was also used. Oh, and I know we got 4 different tacos, but those statements stand across the board. Pay. Jump in the car. Head down the road. Laos Thai Market. Another place I've heard I must hit. A spot that's half market, half restaurant with no real line between the two. An incredibly small kitchen is tucked in the back with residential refrigerators for coolers. The entire place is run by 3 people. Presumably mom and grandma in the back cooking and cleaning with the son waiting tables in the front. Unfortunately that killed our time line taking over 20 minutes to get our green curry with chicken. It was *almost* worth it. The curry was spicy, clean and balanced - not at all cloying with coconut milk. Back in the car to see what else we can find. A quick drive-by Shang-Hai Garden Chinese & Mexican food for a laugh, but no food. Then a pit stop at Stoysich House of Sausage for some jerky that Paul had been calling "meat butter". Opps, that was Wohlner's Grocery that had the "meat butter". Nothing wrong with the Stoysich jerky though. Next place. Here I elected to cheat just a tad. The International Cafe is a 1/2 block off of 24th Street, but how do you pass up the opportunity to have East African food in Omaha? Don't be thrown off the trail by the "House of Gyros" tagline. Inside are the goods. Falafel, Sambusa, something called Mendase and more. We ordered the Doro Wat on Injera. We quickly dug into the braised chicken in a nice rich red sauce. You'd swear has tomatoes in it, but you'd be wrong. 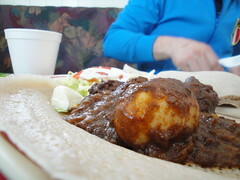 The injera here was rather delicate, so forks are not a bad idea. Keep in mind that being Muslim requires prayer through-out the day, so be prepared to wait if you go during one of these times. For our last stop with the full crew, we sought out the Southern Boys Cafe. Not much to look at on the outside, but the inside is plastered with character. Pictures, posters and the guitar in the corner give you a fast idea about the owner in case you don't get a chance to meet him. We got a chance to talk to the owner and I think the place is appropriately named. 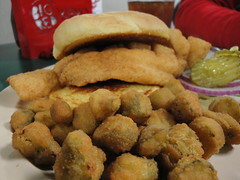 We ordered ribs and fried okra, but were easily talked into getting the fried catfish as well. Everything was excellent. The ribs were unique with just a ton of flavors going on. The okra was some of the best I've ever had. At this point, Paul and Nick both had to head back to "the office". I chose to carry on since there were a couple more places I wanted to check out. I was told I should stop at Chef Mike's Community Cafe. Since Thursday's are soul food day at Mike's, who was I to argue. It was not what I was expecting it to be. Don't expect a restaurant. Instead this is basically a cafeteria. My stomach was getting full and I had other stops I wanted to make, so I decided to pass. If you think I made a mistake, leave a comment and tell me how great the place is. Back in the car and continue up 24th to a place I haven't been to in years. I was a little proud of myself for knowing of a barbecue place that one of the members of Greater Omaha Barbecue Society hadn't heard of. Not to mention a little funny since the person in question happens to share the same name as the location in question. 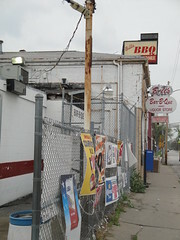 Granted the place is called Bill's BBQ, Liquor Store and Gas, so not being a dedicated barbecue joint might have something to do with the oversight. Waiting for your 4 bone ribs while people get rolling papers, alcohol and Starbursts is a little amusing. I should also mention, in case it wasn't clear, this is not a restaurant. There are no seats, no counters, and certainly no hostess. You walk up to the barred window, order your food and go. It's not the best BBQ in Omaha, but it's not bad and worth a slight detour if you're in the area. My final stops for the day actually weren't on 24th Street. I popped up to the Institute for Culinary Arts at Metro Community College to drop off some of Bill's barbecue to some friends. If you haven't seen their new building yet, get out there ASAP. It's amazing. I believe Omaha will become a destination school for those entering the culinary field because of the incredible work put into this new facility. And if you haven't been to Sage Student Bistro, change your dinner plans soon. This is one of my favorite places to eat in Omaha. By now it was time to head home. Since my wife didn't get a chance to join me, I wanted to bring home some dinner. What did I bring her? Some of the Best Fried Chicken in Omaha from Time Out Foods at 30th and Pinkney. A good Southern style fried chicken with a nice crunch and a spiciness that adds a little zip, but is not overpowering. The potato salad and coleslaw were both tasty as well. It was a long day and a food coma ensued, but it was completely worth it. Hopefully our journey will inspire others to really investigate all their town has to offer and uncover some special gems that are worth the trek. Eat well. Foodbuzz for funding our tour. Paul Kulik and Nick Strawhecker for joining me. Food & Spirits Magazine from whom I borrowed this idea. All the restaurants that we visited for just being there. Apologies There was supposed to be video to go along with this post. I'm still trying to get the technical difficulties worked out on that one. While doing my research, I stumbled across a thing of beauty. 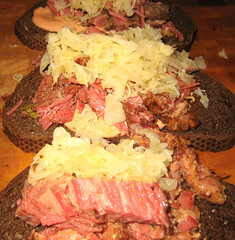 Thick, moist, tender looking corned beef atop a dark rye bread and a nice line of sauerkraut across the top. To make things even better, there was a story behind the photo. The grandmother of the person making this work of art claimed to be the sister of a waitress who worked at the Blackstone Hotel! And to do one better, her sister: Fern Snider; the lady who can probably be credited for bringing national attention to the sandwich. Anyway, you can read Shannon's grandmother in his own words on Flickr. I also asked Shannon if I could re-publish his photo and recipe to share here. His recipe is really more of some guiding principles, so I've condensed/paraphrased it a bit, but you can always check out his original instructions to check my accuracy. If you're a Flickr member, take some time to thank him over there. Seek out the the best ingredients to get the best flavor! Start with a dry rub of fresh ground pepper, then apply caraway seeds, kosher salt, and hot Hungarian paprika. Brown the brisket in a large cast iron pan with a small amount of EVOO. After browning, throw in some rosemary, garlic and thyme to heat, but not scorch. Course chop half a cabbage, then add it to a slow cooker. Add the brisket with all the dripping and set the cooker to "low". Use two pieces of a local bakery Rye bread or some variation of it. Select a Russian or 1000 Island dressing that suits the sandwich or make your own. Use an Emmental Swiss cheese or something similar that is not too sharp and without a lot of "feet" funk, such as a baby Swiss cheese. Look for something that hasn't been aged long and has smaller holes. Find a Sauerkraut you like or make your own. Be sure to drain the Sauerkraut as much as possible to avoid a soggy sandwich. Build your sandwiches between the two pieces of bread. Ratios for balance of ingredients are important, so avoid the ginormous pile of meat you often see on TV. If you add too much, the sandwich falls apart and will not heat in the center. Heat your sandwiches in a the large cast iron pan. If making more than 2-3 sandwiches, consider using a 2nd pan. Preheat the pan with some EVOO over medium-to-medium-high heat so the oil shimmers, not smokes. Add the sandwiches until toasty "golden brown". Yesterday marked our 5th anniversary here at Gastronomic Fight Club. It also marked a bit of a turning point. As I mentioned previously, we'll be bringing on several new contributors. The purpose of this is to provide our readers with more frequent content. I think it also brings some additional benefits such as fresh points of view and coverage of topics that would have been glossed over in the past. Throughout the year we'll be introducing our new writers as we bring them on board. Please make them feel welcome as they are all part of our community. They are passionate foodies, just like you. They are sharing their opinions to help our community grow and raise the bar for everything we eat. I also ask that you give no one a free pass. I've taken the approach that I will bring many people into the fold if I feel they fit well with our team. I will leave it up to our readers to provide us feedback about which articles they want to see more of and which writers they really enjoy. We ask that you be patient and give everyone a fair shot. Once you've done so, if you'd like to share your praise or criticism, please contact us to express your thoughts. Our new site will launch on May 1st. Until then, expect things to be fairly boring around here as we busily prepare. Thanks for a great 5 years. Your city! Find the perfect place. Rehearsal dinner, Corp. Party, Banquet venues.